She is the most easy going person, stress-free and helpful. It was so needed when the purchasing process got stressful at times. Monica is not only there to sell you a house she is also there to advise you where and how to fix it if you have a problem with great knowledge of local tradesmen. We truly appreciate working with Monica as it was the first house we bought and we didn't understand the whole process so every help was needed. "Monica was fantastic to deal with, as were all of the staff at Roger Loughnan Real Estate. We were very happy with the service we received and found the staff to have a great amount of knowledge in all aspects of this field. I would highly recommend anyone wanting to sell a property in this area to use Roger Loughnan Real Estate for professional and friendly service. " Monica was the true professional in all areas. Great dealing with her & the firm. Thanks. Roger and Monica have a plethora of local knowledge and were willing to take on a sale that was a bit out of the ordinary and probably required more effort than normal. They were respectful of our requests and kept within our criteria. We are extremely grateful for all of their efforts to help us achieve the sale that we wished for. Thank you for all that you did for us at our recent home purchase. During the Inspection and Purchase process we found Roger Loughnan and his team to be Honorable. Courteous and nothing was too much trouble. So a special thank you To Roger, Monica and Susan. We would definitely recommend your Real Estate agent to anyone whether it be Selling or Buying in the Sunshine Coast Hinterland and surrounding areas. Roger was a fantastic agent. He was a great communicator, who showed respect to both the owners and myself as a prospective buyer at all times. He was very genuine and I felt he had my best interest at heart. He promptly addressed any questions or concerns that I had along the way. Overall, the sale process, which involved both Roger and his staff, was very professional. I would not hesitate to recommend Roger and his team to others. The recent sale of our property at 27 Ensbey Rd, Flaxton was executed by Monica in a courteous efficient relationship to our satisfaction. We recommend Monica McLaren to anyone trading Real Estate on the Blackall Range. Having had some really bad experiences with agents in the past, to find this agent was very refreshing. Roger and his team were honest, reliable and extremely helpful in making the process go smoothly. They obviously had great communication with the vendor and made us feel very confident with what is a major purchase. Their local knowledge was clear and backed up the pricing research that we had done ourselves. At no time did we feel pressured into buying and we feel that we have had a good introduction to the friendly flavour of this community. Great to deal with and very understanding for both parties. Would recommend Monica highly. The whole team were just lovely to deal with, nothing was too much trouble for any of them. They really helped me out with their local recommendations and support whilst trying to coordinate tradies when I recently purchased my property. The team seriously went over and above and exceeded their agent “duties”, their ongoing communication made everything so much easier and more personable. I highly recommend them without hesitation. The purchase was a simple process thanks to the selling agents. Questions received prompt answers. Requests were never too much trouble. Roger was amazing to deal with. We recently purchased a property at Flaxton, QLD and dealt with Roger Loughnan Real Estate as the Seller’s agent. Roger was at all times most helpful with communication to the Seller, arranging extra viewings and liaising with the Seller on finer points of the sale. We found Roger to be very knowledgeable, friendly and honest during the purchase of this property. I have no hesitation in recommending Roger Loughnan Real Estate to any potential Sellers or Buyers. Even tho’ a friend, Roger went the extra yards to clinch the deal in record time. It was a totally positive experience, and (the few) negotiations handled with sensitivity and generosity. Roger was a pleasure to deal with from start to finish. He is very passionate about the area and this comes through in the quality service he and his staff provide. I did not feel pressured at any stage of the negotiations and he went out of his way to accommodate any requests. All communications were answered promptly. I would recommend to anyone. Sale of our property with Roger Loughnan Realty was a pleasure. The integrity demonstrate through the out sale process was appreciated as well as a shorter than average time frame was a huge relief. have no problems recommending Monica. She has been a pleasure to work with and has proven to be an outstanding agent for us during the purchasing of our property. Monica has actually gone above and beyond my expectations of an agent. She has been professional and reliable, and has been considerate to all parties involved. I would be pleased to work with Monica any time in the future and would have no hesitation recommending her to interested parties. Both Roger and Monica were very helpful, communicative and generally positive. We have utilised the services of Roger Loughnan agency to sell two of our properties in the last 12 months. Roger himself is trustworthy and reliable with a sound knowledge of property on the Hinterland. We have no hesitation in recommending Roger. We had been looking for a house for some time and had decided to drive past two houses that were listed for sale to get an idea of their location. One house had already sold, but the other still had its for sale sign up. We noticed a car in the yard and thought it wouldn’t hurt to stop and speak with the gentleman standing near the car. It was Roger. He was waiting to show some other people through the house. He didn’t mind at all us dropping in unexpectedly. From our very first introduction to finalizing the sale, Roger (and Monica) was a real pleasure to associate with. He is an excellent communicator, knows the market well and if he couldn’t answer any of our questions on the spot, he always came back a short time later with the answer. At the same time as being highly professional, he was also warm and friendly and sincerely eager to help us with our house choice and purchase. Monica was very helpful and did a great job. We purchased through Monica back in 2002 and she did a great job in meeting all our requirements and managing the process. Over the intervening years we kept in touch receiving feedback on the market and what was happening around Mapleton at that time. When the decision to sell was reached we discussed the situation, agreed a price and listed our property. The sale process was managed seamlessly and all minor issues dealt with in a professional and collaborative manner. Monica is a reliable, trustworthy and understanding agent, quick to respond and a pleasure to work with. I have known both Monica and Roger for more than 20 years and they have sold several houses for me during this time. Unlike many Real Estate agents they always conduct themselves in a very professional manner, are easy to deal with and I always felt that they had my best interests at heart. This was our second experience utilizing Roger and Monica to sell our dream block of land. During the process of selling we came across a few scenarios which required an agent with excellent negotiation skills, plus an above average understanding of Real Estate lingo. While there may have been a few hills and bends to navigate, it was completed with remarkable ease by Roger/Monica and team. They service the sunny coast hinterland cheerfully. Can’t speak more highly of the RL team – excellent! We were very happy with your professional & friendly manner & thank you so much. Roger and staff provided a great service over an extended period, dealing with several potential buyers and maintaining good communication throughout. Monica was fantastic to deal with and worked around my shift work and was considerate to our family requirements while working to sell our home! We felt completely confident in her ability and were extremely happy with the outcome of our sale! Monica made herself available whenever required and was always happy to provide support and advice!! Monica was extremely helpful from our first viewing of the property through to and after us taking possession. She had both our interests and the sellers in mind and negotiated in a very responsible manner. Nothing was ever too much trouble and Monica always replied promptly. She was knowledegable, open honest and forthcoming about any issues that we discussed. Roger Loughnan and his team were EXCELLENT in their guidance through the whole sales process. Thank You Very Much. We found both Roger & Monica to be a great help through the entire process. Would be very happy to recommend them to others looking to purchase. Without a doubt, Roger and Monica made the process of the sale of this property trouble free. Nothing was ever to much too ask for and their support with the property as a local was excellent. Highly recommended and highly commended for doing a great job. Thank you Roger & Monica. Roger is both realistic and knowledgeable about the real estate market and the prospects for selling. He is approachable, friendly and a genuinely decent human being. Not at all a hard sell but effective. Monica was very professional and helpful. Always pleasant and nothing was to much trouble. Very prompt and efficient. Roger has a low key, no pressure approach, but always had the answers and contacts available whether we needed an arborist or a solicitor. The complete transaction was relaxed and we appreciated that Roger organised time for us to be with the vendor, which is very necessary when purchasing a more complex property. We have bought and sold properties with Monica twice now and each time was a seamless and easy experience. Monica kept us informed at every step of the way and went to great lengths to meet our needs. She took the pressure off us and did absolutely everything on our behalf. If we get the opportunity, we would use Monica again in a heartbeat. All the best to Monica and Roger. Roger is a courteous, efficient and especially knowledgeable in the real estate field. He is extremely knowledgeable regarding the negotiations with the buyer. We found Roger easy to deal with. He has a great understanding of the local market. Thanks for your service. I cannot speak more highly of Roger for his outstanding service. Throughout the whole process, he was unfailingly helpful, courteous, knowledgeable, ethical, and professional in all matters. I was kept well informed every step of the way. I appreciated his advice and was very happy with the quick sale of my house. It was a stress-free experience. I have absolutely no hesitation in recommending his company to anyone planning to sell their home. Roger and Monica are the most professional and trustworthy agents you could wish for. Every detail is taken care of and you can relax knowing they are on the ball. We have both bought and sold with them and completely satisfied in every way. Right from the outset Monica impressed with her friendly & helpful manner & demonstrated a very good knowledge of the local real estate market. She gave me very good advice on how I should present the property to improve it’s appeal to potential buyers. All her advices re the value of my property were realistic & spot-on, & resulted in a quick sale at the asking price. I was very happy with her overall performance. The service was attentive, and always had time answer any questions. We visited the property on several occasions, to help in the process of making the best choice for our new home. Monica and the staff at Roger Loughnan Real Estate were very helpful and professional. Good knowledge of the property, could answer most questions on the spot, wasn’t pushy, no problems with the purchase. Very pleasant and easy transaction … lovely honest and genuine folk . Highly recommended. I would and will promote Roger Loughnan Real Estate to all I meet because they are honest, true, realistic and totally trustworthy. This industry is full of unethical people, but Roger and Monica are NOT in this league. We are totally satisfied with the way we were treated. Monica is an outstanding professional with excellent judgement. We could not have had a better interaction with a seller’s agent. She would be our first should we ever choose to sell a property in Mapleton. It is not easy for an agent to satisfy both the seller and the buyer in a transaction. Monica has this gift. At all times Monica acted as a fair and honest agent. Although it was her job to act for the seller, she also was supportive to us as buyers. Best agents to deal with. Genuine, honest, helpful, friendly, accommodating and more than willing to go above and beyond to assist in any way. Definitely recommend this agency. Monica sold us our property and Roger was also involved. Both agents were very knowledgeable, courteous and friendly. When we moved in we were a little upset to how things were left and even though this had nothing to do with their agency Roger provided us with a gift voucher to a lovely local restaurant. This was an unexpected but such a lovely gesture. Thank you Roger and Monica, to give your all as excellent country real estate people. Success within 24 hours! One can’t get much luckier than that! Well done! Please note that I was very happy with your professional approach to the selling of my property at 42 Burgum Rd and happy with the result of the Sale. Your courteous approach and gentle nature appealed to me and I thank you sincerely for your effort. Monica was and is very good in all things. All very good! If I had something to complain about, I would do just that. Roger did listen and understand our needs. Standard of service was above expectation – very efficient, helpful and professional. I couldn’t have been happier or more impressed with the service I received. I felt comfortable throughout the whole process. Dear Roger, thank you for the excellent service that you and Monica provided during the sale of my house at Kureelpa. You always acted in a professional and ethical manner on my behalf. You kept me well-informed every step of the way and maintained an honest and realistic approach to selling time and price. You negotiated the best outcome for me which was a quick sale and settlement at a price above expectation. The whole process was stress free which was much appreciated. I have no hesitation recommending your services to others. We both very much appreciate the amount of inspection time and access we were given to the house and Roger’s willingness to organise and facilitate this for us. Being so approachable made dealing with Roger a non-stressful experience for us. Thanks for your relaxed and amenable approach to selling us the property Roger. I am very happy to give Roger Loughnan Real Estate this testimonial. At all times they provided an excellent standard of service, delivered in a cheerful, confident and realistic manner. Their advice as to how we could improve the ambience of our property was invaluable. We have dealt with Roger and Monica previously and had complete confidence in their honesty and genuine understanding of what we required. The are our first priority in all our real estate matters. We recommend them with complete confidence in the quality and level of service they offer. All matters were dealt with professionally and with care and respect. Faultless! Thank you very much for your assistance with the sale of the furniture and kitchen ware. It was very much appreciated. I was very impressed with your service. Thank you very much. Thank you for your tolerance. Understanding, sensitive and dedicated. Worked hard to get the best result possible for us. Very ethical, honest and helpful in every regard. Kept communication lines open at all times. Prefer the method employed of maintaining lower level of upfront costs in comparison to other agents. Our experience with this agency proved to be a successful outcome for all concerned: delighted purchasers and sellers who are satisfied with the result. Communication with all parties was consistently maintained to a high level at all times so that there was no possibility of misinformation or conflict. We valued the calm & efficient manner by which a successful outcome was achieved. Roger and his colleagues are a great example of Real Estate at its best. Communicating regularly, always find time for you, make sure they understand your needs and preferences. Courteous to all at all times. We often talked during our journey of the need for feedback and this is vital at the clients end. Monica, we want to thank you for keeping the website changed and attractive. We changed agents to Roger Loughnan Real Estate because we weren’t getting genuine lookers/buyers. We had a unique property to sell and they were honest and enthusiastic from the beginning. Selling a property is a journey and Roger and Monica believed in the product and kept us positive and always focused on the day we would sell. There was no bargaining on the price, they achieved our asking price with a win/win situation for us the seller and our buyers. They are honest and trustworthy, strong with the needs of both buyer and seller. Recommendation – absolutely!! Roger has great local knowledge which gave us confidence in the context for the property we purchased. We had wonderful open access to Roger who was our conduit to the sellers. He offered steady contact without overwhelming us. Roger’s quiet manner understates his knowledge of farms/land, people and the community. He was always prompt in this response to any questions we had and a pleasure to deal with. Our joy now living on the property is testatment to Roger’s honesty and insight in fitting buyer and seller together. We highly recommend Roger Loughnan when buying or selling property. We located our property online and emailed Roger and he emailed us promptly and sent us more information and pictures of the property. He was always accommodating with our requests and he went out of his way to make things happen for us. Also, thanks to Monica who was also very helpful in our house-hunting journey. I was very happy with the way the sale was handled and especially found Monica very personable and pro-active. And I would definitely consider using your office should any further occasion arrive. Monica is very professional and straight forward in her dealings. She handled our transaction with style! Monica was helpful and very easy to deal with. We were very happy with the way she communicated and helped us through an unusual purchase. She always replied to emails and messages promptly and sorted things out straight away. On this sale she would have had her patience tested! I highly recommend to any person whether seller or/and buyer to go through Roger Loughnan Real Estate. The staff are extremely supportive and very informative. They go beyond any standard I have previously been subject to. I had recently arrived from New South Wales and Roger Loughnan Real Estate, and in particular Monica McLaren, were professional in steering me through a property purchase in Queensland. I have no hesitation in recommending them to anyone buying or selling property. We believe that Monica and Roger acted with professionalism, honesty and integrity. While the market was slow, we felt that you were always working to sell our property. From the outset of selling our property we had huge confidence in the ability of Roger and Monica to market and sell our property. They understood our expectations and offered professional advice and encouragement. We would certainly use their services in future real estate dealing. It was an easy decision to entrust the sale of our home and property, ‘a labour of love’ to exclusive agents at Roger Loughnan Real Estate, Mapleton. The team were at all times loyal and trustworthy agents who quickly developed a good rapport with us both and, more importantly, an understanding and appreciation of our property and all that it had to offer. We felt that they were attuned to the type of buyer we were hoping would be attracted to our property, and in good time managed to make a perfect match. Your dedication and support over the long term was much appreciated. If I were to buy in the area again, I would without hesitating choose your agency knowing the caring attitude shown to myself. Thanks to you both. Very accommodating and professional throughout our purchasing experience. It was a total pleasure to deal with Roger Loughnan Real Estate as the selling agent for our Maleny property. Roger and Monica were always honest and up front and worked very hard markerting our property. We always had total confidence in their ability to sell our property, in this tough market, at a fair price for us and for the buyer. They both practise very strong ethics and morals. Their honesty makes them such a pleasure to work with. I chose Roger Loughnan as my agent because when purchasing a home Roger and Monica cared and went out of their way to be of service. I knew all would be done to get a buyer for my home. I have and would always recommend Roger and Monica they are a wonderful team together. I thank them both. The team at Roger Loughnan provided us with unique properties to view in both Maleny and Montville. Any questions that required answering they did so with speed and accuracy. I would not hesitate to recommend their Mapleton office to anyone wanting a property on the Sunshine Coast Hinterland. Thank you Mapleton team. I found Roger Loughnan Real Estate a very genuine and friendly office to seek property options in the area. They were truthful and honest about their listings, they listened to my needs (not what they thought I needed), they were efficient but gave ample time. In follow up viewings too, they answered questions honestly and followed up with more detail where necessary. They were supportive but didn’t apply pressure or “play games” – their word is their honour, the highest of values. Our friendship is ongoing which speaks volumes for Roger and Monica. 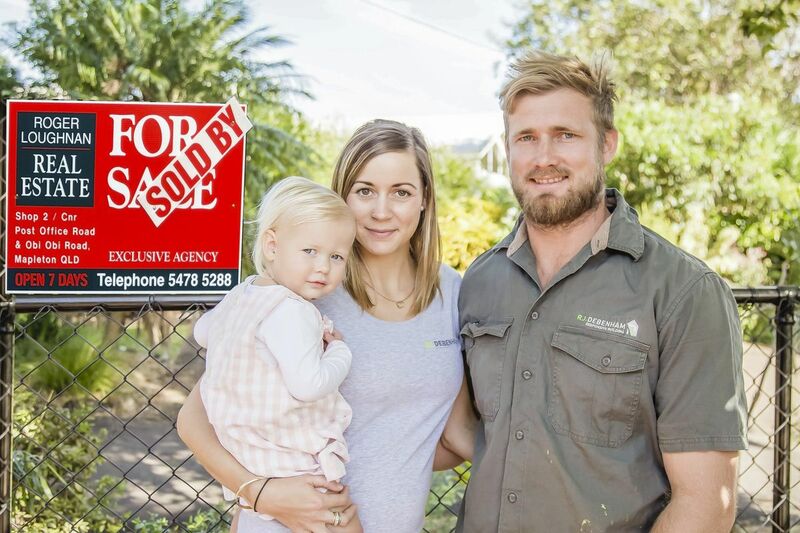 From buying our land through Roger and Monica nearly 12 years ago, to the sale of our house recently we have found them always approachable and have found their service totally professional in every way. We would have no hesitation in recommending their services to any prospective purchasers or sellers. In truth Roger, you know I have the greatest respect and love for you. Garrie and I very much appreciate the guidance you provided to Emma, the patience you displayed and as always the honesty and professional manner in which you conduct yourself. Should we ever need to buy again, and we anticipate we will, we will absolutely call YOU!! I hope this helps someone else achieve their goals. Well our story starts with building a beautiful home we were going to live in forever, so spared no cost. Five years later, family changes and time to sell. Agent One – Oh the market says late $500’s and you will need to pay $3,000 in advance. Agent Two – Oh the market is no good we won’t achieve good results, but if you give us $5,000 in advance we will sell your house. Monica from Roger Loughnan Real Estate came last. Well what a wonderful change. She was so positive, “Let’s try and sell it for what you paid, let’s see if the market meets you.” And she did, we sold our home for the best possible price without spending thousands of dollars on advertising. We are very happy. I would recommend you to our friends. The service was professional, informative and Roger was friendly, easy to work with and a gentleman. Everything went very well, I think Monica does a very good job. She is very friendly, very open and always willing to help or give advise, and the advise was very helpful. Great to do business with you both. We would recommend Roger Loughnan Real Estate to anyone wishing to purchase a home on the Blackall Range. We felt no pressure to buy and found everyone in the office very friendly and helpful. We are delighted with our new home which Roger made sure was in a very clean and presentable condition. The exceptional quality of the service made our move so much easier and pleasant. Because my late uncle has used Roger and his team to sell his land, I had no hesitation to enlist the firm to sell the remaining two blocks. I felt the staff were very professional and were very willing to help. I was very impressed by the frequent communication from Roger to update the progress of each sale. I would definitely recommend Roger and his staff to undertake any selling and/or purchasing opportunities. We selected Roger Loughnan Real Estate as his office follows the Neil Jenman philosophy of Ethics in Real Estate. Roger demonstrated the utmost respect for us as his clients as well as our property. We formed a strong partnership and Roger and his team were very happy to comply with our marketing strategies and pricing movements. We encouraged and received regular feedback and he went to great lengths to present our property to prospective buyers even when we were absent. Through Roger’s efforts we sold our property for a very satisfactory price in a time frame that was 50% faster than other properties in our area. We couldn’t be more pleased and grateful for Roger’s efforts. I would not hesitate to refer Monica to anyone. Her professional and yet country manner was relaxing yet informative. We always felt valued and we enjoyed the fun of buying a home. All our questions were treated in a valued fashion and satisfactory answers gained. Your liaising with us and the seller certainly made for a smooth transition. It is a pleasure to do business with Roger and his team. They behave like good friends as well as being trusted advisors. We chose the agency because we know you work with integrity and have the experience. We found the staff always to be personable but efficient. They speak well of everyone (buyers and sellers) which creates a very positive experience. The best experience was getting a sale for a great price, well done! After we explained our last real estate experience to you, you listened to our concerns and you gave us your word you would act professionally regarding both parties (buyer & seller). We had an extremely positive experience and were very satisfied with everything. Your company has restored our faith & trust in the real estate profession. Your standard of professional conduct is impecable and your personalised service was outstanding, your service was excellent. Dealing with your agency is more like dealing with trusted friends. We took your advice and ended up with a great outcome and achieved a price more than the asking price. I have had dealings with many business people and often find the sales part is good, but the after sales service is poor. With Roger Loughnan and staff I happily found the service to be excellent and personable both during the sale and the after sales follow up service. I really appreciate people who are good to their word, and who deliver what they say they will and who represent the buyers and sellers interests. We selected Roger Loughnan Real Estate becuase of your association with the Neil Jenman philosophy of Real Estate conduct. We found the process of selling almost painless. Monica and all the staff were exceptionally patient with us as we blundered our way through the selling process and guided us to a successful outcome even thought he selling conditions were difficult. I found the integrity of the Roger Loughnan Real Estate team to be in keeping with the Neil Jenman guidelines for real estate conduct. Our experience of your service was that it was the most skillful and smooth transaction possible. Your response to our initial enquiries strongly influenced our decision to list with you. In the long lead up to our decision to sell we greatly appreciated your advice and the time spent by Monica on our behalf. Thanks you for a professional and satisfactory outcome. Roger and Monica both provided ongoing and professional attention. It was a challenge for them as our property was rented through much of the selling period. They had frequent contact and advice and very good liaison with the solicitor and the rental managers. They were unfailingly helpful and patient with our queries and concerns – many many thanks! As a seller I was impressed by the presentation and attitude. I would recommend Roger Loughnan Real Estate, I found their team to be honest and caring in all their dealings with me. Everything was smooth flowing. We had absolute confidence from day 1 and could not fault your service or advice. Your genuine approach and sincerity were evident from the start and your service was faultless and very professional. Roger and Monica were always happy to oblidge with their time and advice. If only dealing with agents could be so straight forward and professional. The business exudes a real ‘country feel’ that makes you confident that all will turn out in the end as it did for us. It was a pleasure. I was very happy with the service. Roger and his staff made the whole process of selling our commercial property in Montville very easy with good web presentation and effective liason with prospective buyers. It is a pleasure to deal with a firm that prides itself on its integrity and a high level of service. Everything was handled very efficiently with pretty minimal effort on our part. I was very pleased with the service provided by Roger Loughnan Real Estate. Throughout the marketing period i was kept fully informed and felt like i was getting individualised attention. Depsite the slow market at the time, Roger never wasted time showing the house to buyers that the house obviously would not suit. Instead, he guided the right purchaser to making an appropriate choice. I would thoroughly recommend this agency. Roger was recommended to me because of his integrity and honesty. I am pleased now to count him amongst my acquaintances. A decent bloke! Roger, Monica & Lara – you have a great team together. Thank You! It has been a pleasure having your company represent the sale of our home in Mapleton. We can honestly say we had a positive experience from beginning to end with you and your staff who always treated us with courteous and professional service. We sincerely wish you every success in the future.